We are very sorry we haven't talked about Axanar for a while. Hope you can accept our apologies. We will address this inconsistency forthwith. It's true we haven't spent any time looking at the amazing progress of Prelude to Axanar if nothing less, but in the last fortnight we've been privy to some brilliant new footage. So, let's start at the beginning of that journey. First up was a great little sneaky look behind the scenes which showed our first proper glimpse of the cast in character and the crew at work. It's definitely heightened interest and we all thought that this was going to be our lot for a while. As actual in-movie action goes there's not a lot - a shot of Kate Vernon as Captain Sonya Alexander a bit beaten up is really your payoff there but we do manage some superb closeups of Richard Hatch being made-down from his role as Klingon Supreme Commander Kharn as well as some shots which reveal his uniform is not too far off that of General Chang from Star Trek VI. 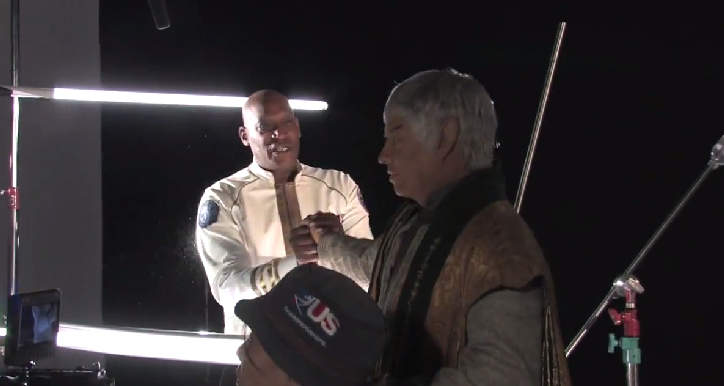 Chang is actually in Axanar as Kharn's subordinate for those who might not know. 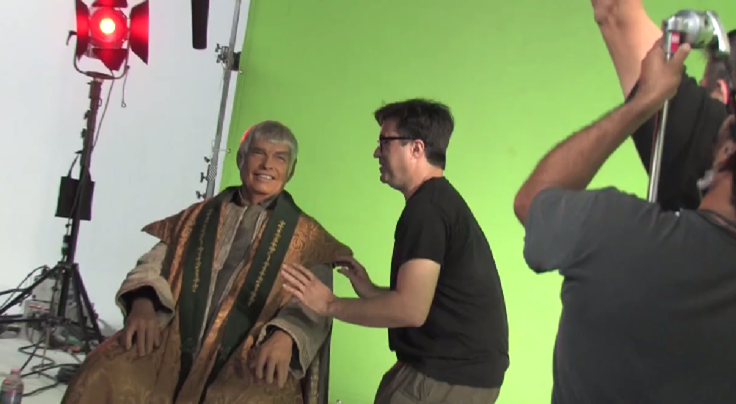 Gary Graham is also there in a couple of shots in full, older, Vulcan makeup as Ambassador Soval whom he originally played in Enterprise. Both Hertzler and Todd can be seen in their Starfleet dress uniforms during filming and there's even a snippet of dialogue in there as Todd's temper frays in his role as Fleet Admiral Ramirez. The dress uniforms do have a sense of The Original Series' dress uniforms with a touch less silky sheen to them while the glimpses of duty uniform are very much, as we knew, in keeping with the feel of The Cage. Understandably there's some green-screening in there which will help keep the sets budget down if nothing else and also means not too much is being given away here. Hearing from the major players here gives a lot of resonance to the Axanar stable. If the speed at which the basic funds and then the stretch goals for this project were reached are anything to go by then completing the full length movie might not be in the bag but it's almost certainly going to be an easier task than might have first been expected. So while we were getting all wrapped up in the excitement of the sneak peek, those Axanar bods pulled the full 2:53 trailer together and IT'S AMAZING. "The basic idea of what Prelude is, is totally different from anything Star Trek fans have seen before." Executive Producer Alec Peters told us; "It is basically a History Channel special on the Four Years War." Straight off and seconds in we're seeing some stunning CGI of the Klingons taking the battle to the Federation, destroying ships, worlds and anything that seems to get in their way. Then we get to hear from some of the key players - those notables that we've already heard from briefly in the sneak peek but this time fully in character - and can Tony Todd chew out a scene or what. This is a very different way to explore your project and present it to fans - first giving just a morsel of information and then a short film to introduce what you're going to attempt in the larger movie. Peters and the Axanar team don't really give much away even in the monologues from the onscreen characters which do start to show us how they are going to be portrayed and maybe glimpses of their angles within the story. Yes, we see some ruined and badly damaged buildings, others engulfed by fire as well as multiple space-borne conflicts to whet your appetite but I really think the key is to look at how each of the protagonists here responds to the unseen interviewer, what does it tell us about their characters and what we can expect? Admiral Ramirez (Tony Todd) is certainly a character cast in the best tradition one leading from the front, giving stirring speeches and seemingly passionate about defending the traditions of the Federation to provide a better future - could he be a man prepared to do anything to ensure that this is achieved? Captain Samuel Travis (J G Hertzler) is much more reflective as he looks back at Axanar. While we're not sure exactly what he's referring to here, there seems to be some appreciation for Admiral Ramirez and also the realisation that something had to change. Looks as though Travis could be some sort of advisor in the movie, providing suggestions on where the Federation need to go to secure victory or even a mentoring role with Garth. Heading the opposition and fleets of D-6 cruisers is Kharn (Richard Hatch). A seemingly confident man who's confidence and misunderstanding of the Federation could ultimately lead to his downfall and the defeat of the Klingon Empire. His monologue shows the wonder of hindsight are alive and well in the 22nd Century. One of the two characters in the trailer who previously existed in the canon Star Trek universe is Ambassador Soval (Gary Graham) last seen in the four seasons of Enterprise. For once we see a Vulcan admit failure - a costly failure at that. How Soval will appear in Axanar will be interesting. Will he continue to negotiate for peace or will we see him clearly side with Starfleet to fight - the only logical conclusion to failed peace talks? The second of three fleet captains featured in the trailer is Sonya Alexander (Kate Vernon). Her brief appearance indicates a commanding officer faced with a futile battle and an apparently lost cause against the seemingly mightier Klingon forces. Is she destined to be the more pessimistic counterpoint in Axanar to Garth or Travis? Will Alexander be a part of the final battle and what part will she ultimately play? I suspect the prelude will show her constantly on the back foot against the Klingons. Perhaps rightly so the final sound-out is granted to Kelvar Garth (Alec Peters), the hero of Axanar. 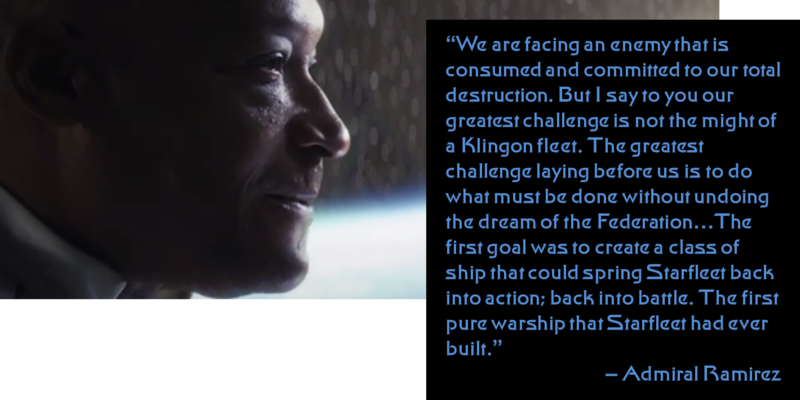 I actually think this is the most insightful of the sneak peek talking heads, demonstrating that the original intent of Starfleet was far away from battle. Is there a reluctance to fight or is this an acceptance of the brutal truth of reality? We look forward to finding out. Said Alec in relation to the performance of his assembled cast: "(Their work was) Outstanding. I think everyone is impressed. And Christian (Gossett) did a great job directing them, so the performances are insanely good." While the interviews are at the core of this trailer, the graphics are mind-blowing and give us some crystal-clear closeups on four different types of Starfleet ship (three pictured here and the fourth being the USS Ares) and the D-6 Klingon cruiser. We also spotted those phaser cannons which are more reminiscent of the JJ Abrams USS Kelvin than The Original Series. In fact there are some bits on the ships in the image here that also indicate a leaning in that direction. Now Alec Peters has told us that the Federation ship classes have yet to be named but we've got some suggestions if he's interested in hearing them or how about a fan competition to choose? While we can admire the beauty of the CGI, the work on the talking head interviews is equally as perfect. The lighting works a treat, playing light and dark against each other and you instantly forget that the backgrounds are digital because everything looks so authentic. So far this is looking to be one of the truly great and epic fan works made so far and could well be the benchmark for years to come - and that might only be a nod to Prelude let alone the full movie. "Everything went smoothly (with the production)." reported Alec. "I think the greatest challenge was managing the budget, as a professional film has much greater costs than a fan film, and this is mostly definitely not a fan film." Our "inside man" at Axanar confirmed that the project is going better than they expected; "But also it takes longer than we would hope because quality takes time!" - and I'm sure as fans we're more than happy to hear that there's care and attention being paid to ensure a high quality result. The response from fans globally for Alec Peters' project has been something of a phenomenon with 25,000 people alone following their updates on Facebook. The buzz has been immense and is outstripping a lot of other well-known fan projects for interest - maybe with the exception of Renegades which is pushing a Facebook following of 105,000 but that's had even more publicity perhaps and features an equally franchise-recognised cast. So what's next? Well the 20 minute Prelude to Axanar will get it's premiere at San Diego Comic Con and then the Kickstarter funding for the full length Axanar feature will begin with filming planned for the Fall (Autumn) of 2014. It still seems like completion is a long way off but the release of the sneak peek behind the scenes and the magnificent Prelude trailer will have reassured fans, backers and those involved with the project that this is happening and will come to fruition. Are you ready for Axanar? Is it the film you're waiting for? Let us know below! No Trek to Netflix - Is it Time to Get Real? Get to the Escape Pod! Renegades: Will it Beat Of Gods and Men?